Is Soy Healthy for Your Family? I love biting into a steaming ear of roasted corn on the cob, picked fresh that day in an organic cornfield. This is completely different from slogging down a super-size soda sweetened with high fructose corn syrup that has been chemically derived from genetically modified corn and different from gorging on a dozen donuts made with corn syrup, modified cornstarch and a dozen unhealthy ingredients. Is corn healthy? It depends on how we grow it, how we process it, and how we eat it. How much do we eat? 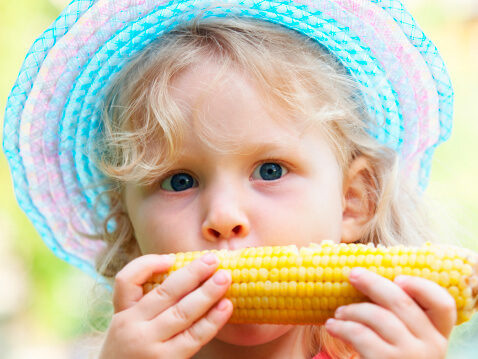 What other ingredients are in our corn-containing foods? What other nutrients are in our diet? Are we allergic to corn? Has the corn been fermented into whisky? Corn (and popcorn) can be a wonderful, delicious, healthful addition to our diets, or it can be an over-consumed, unhealthy ingredient in junk foods that are blights on our society. It can even be turned into non-foods such as plastics, papers, or fuels. In the right amounts and in the right ways, corn is a healthy food for most people, but not for all people. It has been an important source of nutrition for thousands of years. I started a discussion on soy by talking about corn, because corn is more familiar to most Americans. Most of us can recognize a corn stalk. Most have eaten a kernel of whole corn. Most have had a slice of cornbread. Corn doesn’t feel mysterious, exotic, or foreign. Despite the recent explosion of soy-containing foods in the U.S., soy remains less familiar. Many of us wouldn’t recognize a soy plant if we drove by a field, or couldn’t identify a soybean on a plate with great certainty. Tofu, tempeh, edemame, and miso don’t sound as down-home as corn on the cob. Even soymilk might sound strange. We didn’t grow up with it. We understand, perhaps, how we milk a cow; but how do you milk a soybean? Soy is a marvelous, protein-rich, whole food with health benefits far beyond what corn might offer. I’m thrilled when families I work with make organic soy a part of their diets. In fact, soy is a key part of the diet among the longest-lived people of the world. For large parts of the world population, soy and the foods made from it are more familiar than corn. And it’s been an important source of human nutrition for thousands of years. But as with corn, the 20th and 21st centuries have seen a variety of new ways to grow, modify, and process soy. It has crept hidden into our diets in more ways than most people suspect. Is soy healthy for your family? I love sipping a glass of organic soymilk, made from whole soybeans. This is completely different from scarfing down a bag of greasy potato chips made with partially hydrogenated soybean oil that has been chemically derived from genetically modified soy plants and different from gorging on heavily processed convenience foods containing hydrolyzed vegetable (soy) protein, textured vegetable (soy) protein, or soy protein isolates and concentrates. Is soy healthy? It depends on how we grow it, how we process it, and how we eat it. How much do we eat? What other ingredients are in our soy-containing foods? What other nutrients are in our diet? Are we allergic to soy? Soy can be a wonderful, delicious addition to our diets, with proven health benefits. It can be a valuable alternative to animal proteins. And soymilk from whole soybeans can be a great alternative for those who are lactose intolerant. But soy derivatives can also be over-consumed, unhealthy ingredients in junk foods that are blights on our society. They can even be turned into non-foods such as breast implants, candles, plastics, and fuels. In the right amounts and in the right ways, soy is a healthy food for most people, but not for all people. Part 1 of 4 – Is Soy Healthy for Your Family? Part 4 of 4 – Which Soy to Choose?